Tulsa moves into first place entering final weekend of the regular season with 6-0 rout over Utah, clinching home ice in the first round of the playoffs. 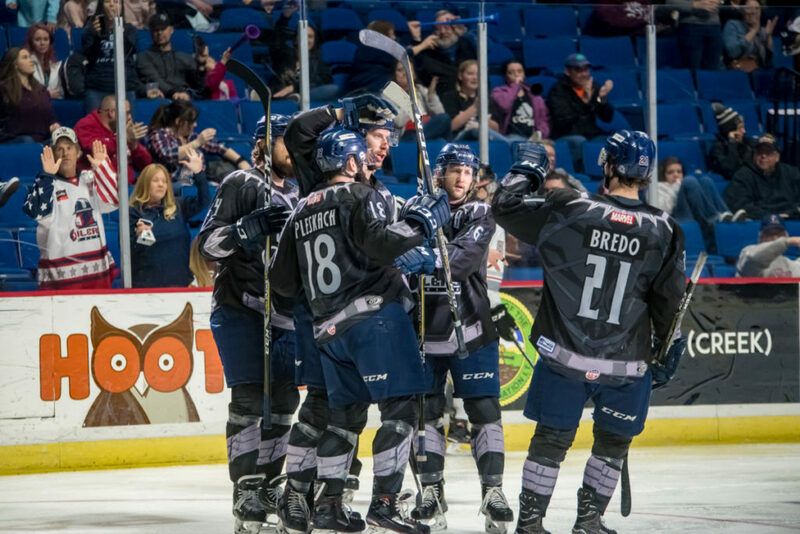 TULSA, OK– Playing two-men short the entire night, the Tulsa Oilers (40-22-6) finished off a weekend sweep of the Utah Grizzlies (35-25-9) with a dominating 6-0 victory Sunday at the BOK Center. With the win, the Oilers clinched home-ice advantage in the first round of the Kelly Cup Playoffs, and moved into first place in the Mountain Division entering the final week of the regular season. An early power play goal from Chris Forneyput Tulsa in front when Forney stepped up into the left circle and fired a rebound past Joe Cannata 2:46 into the game. Mike McKeethen gave the Oilers a 2-0 cushion just over a minute later on a delayed Grizzlies penalty. The Oilers outshot Utah 13-8 in the opening frame. Tulsa added to their lead when Roman Ammiratosnapped a one-timer past Cannata from low in the right circle on another Oilers power play early in the second period. A physical period featured 31 combined penalty minutes and the Oilers kept the Grizzlies off the scoreboard entering the third. Captain Adam Pleskachstepped out of the penalty box and scored on a breakaway one minute into the third period and the rout was on from there. Adam Phillipsfeathered a shot with eyes through traffic from the right point to make it 5-0, and McKee scored 13 seconds later for his first career two-goal game. Ian Keserichstopped all 22 shots he faced for his ninth win and second shutout of the season. The Oilers travel to Kansas City Tuesday night before returning home for games Friday and Saturday against Kalamazoo and Sunday against Wichita. Catch Tuesday’s game on the Sports Animal radio network, www.tulsaoilers.comand ECHL.TV, with pregame coverage starting at 6:45pm.